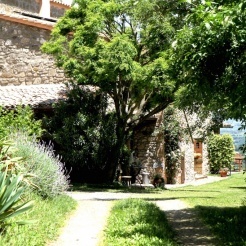 Our country house "Podere Porcino" lies amid rolling hills between Orvieto and Lago di Bolsena where the historic regions of Tuscany, Umbria and Lazio meet. Each of our three lovingly renovated apartments has two rooms plus kitchen and bath and can accommodate up to four persons each. There is also a large room (50 square meters) with hardwood floor, mostly used for gymnastics and available for the organization of other activities such as yoga classes or expressive arts courses. "Podere Porcino" is an oasis of quiet and relaxation surrounded by olive groves, vineyards. The price refers to apartment for 2 persons. Most people pay a surcharge.. Possibilities abound for the more active vacationer: thermal springs at nearby Viterbo, paths for hiking and bicycling, and excursions to picturesque medieval towns and villages as well as Etruscan archaeological sites. The Parco dei Mostri di Bomarzo, and the old town Civita di Bagnoregio.